Sealed roads throughout facility Live in "on site manager"
Corporate customers are welcome to make use of the Conference Room, as well as our photocopying and fax facilities. Fantastic customer service, staff member went out of his way to make sure we were getting a moving starter kit that was appropriate for our situation and within our budget. Very polite and helpful, will definitely be back when we need more items! Hello Nicholas, thanks for the positive feedback! We're always happy to hear good things from our customers. Thanks for the great review, Jessica. It was a pleasure serving you as a customer. Staff were efficient and friendly. The extra month's rental was a bonus, too. No complaints, whatsoever. I have had the most amazing experience so far with SKF. Their staff are so polite and helpful, absolutely fantastic customer service! They have made my first storage venture a breeze and I am super impressed. A massive thanks to Adam and his team for their awesome work! I needed storage urgently i contacted the fyshwick storage king. I spoke with Shannay over the phone and also in store. Over the phone all questions were answered in a professional manner. In store Shannay was very helpful with paperwork and also finding the right size area for what i needed to store. Im completely satisfied with with the company and its policies. Would recommend in a heart beat to anybody who needs a storage facility. Adam is so helpful - great service. Very friendly and helpful staff, especially considering I had to keep changing the details about what and when I was putting into storage. Has been incredibly easy to pop in when I need to to take things in/out of my storage locker. Would recommend to friends needing a storage solution. Great facility, easy to access and use the complimentary resources like the trailer. Staff (particularly Shenae) were also extremely obliging, a big thumbs up! I encountered the best experience I've had engaging a service provider for as long as I can remember. The online quote and ordering was simple, thorough and instantaneous in its response. I drove in 5 mins after enquiring and was greeted and served by a young staff member, who excelled at everything. So when you combine a genuinely professional company who really do aim to please and an individual who is an exceptional you man....you get a very happy client. Was very impressed with the service both on the phone and in person that Adam provided. Never used a storage solution before, it was very easy to make it all happen. Hi Margaret. Thank you for your kind words. I will be sure to pass these on to Adam. We are always happy to help so if the there is anything you need while storing with us pop into the office and let us know. I would give Storage King Fyshwick 5 stars, always helpful and they make you feel welcomed Not all business can give you that. The guys here are brilliant and very helpful, can't recommend them strongly enough. I have had my business storage unit with these guys for over 10 years , I have deliveries all the time all the staff have gone over and above receiving deliveries to my unit in my absence. The staff are always friendly and helpful and the rates are very competitive. Incredibly good customer service experience. First time storer and under all sorts of pressure, the team at SKF made life easy and I have only positive memories to look back on. Since I no longer need help I have closed three storage spaces but next time and always I will hold SKF in highest regard. The team at Storage King Fyshwick has made an overseas relocation, so much easier. Store Manager Brad is unbelievably friendly and helpful. Nothing is too much trouble. At very short notice, not only found us a perfect storage unit at a good price but also a space for our car. They also provided heaps of great advice. Well done Storage King Fyshwick! My husband and I recently signed up to six months self storage with Storage King Fyshwick. Both the store manager and area manager were very helpful on separate occasions answering our questions and showing us their facilities. Excellent Service, talk you through all the options and are flexible in terms of timeframes and space etc. Really good value and friendly staff - definitely recommend. The customer service provided to me by Tim, who was instantly able to provide me with information, advice and an almost unbelievable deal (including storage, lock and boxes) was second to none. I would not store my possessions anywhere else in Canberra, and would recommend that my friends and family do the same. Thank you for a smooth and easy experience, Storage King Fyshwick - and Tim in particular! Storage King Fyshwick is an award winning Self Storage Facility, and with good reason. Centrally located, we offer a clean and modern site with easy ground floor access to all units. We can provide safe, secure and sensible storage solutions at an affordable price. If you need storage for home, business, documents or hobbies, look no further! With one call to Storage King Fyshwick, you will find your packing, transport and storage solutions. We have a huge range of unit sizes to accommodate your every need- from a small locker to a mini-warehouse. The friendly staff at Storage King Fyshwick will help you calculate the unit that best suits your needs; we will even come to you to appraise your home or business free of charge. Our facility managers are friendly and professional and are happy to assist with your complete storage needs. From the selection of the right storage unit, to advice on packing, moving and storing your belongings, we are here to help. Storage King Fyshwick is a state of the art facility, purpose built for self-storage. The buildings are constructed on one level, giving you easy, drive-up access, without climbing stairs or managing elevators. No need to break your back accessing your unit; simply drive up to your unit, unload using our trolleys, pallet jack or pedestrian forklift and the job is done! 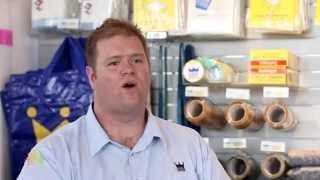 Storage King Fyshwick proudly services Kingston, Narrabundah, Symonston, Pialligo, Queanbeyan, Griffith, Red Hill and Forrest.